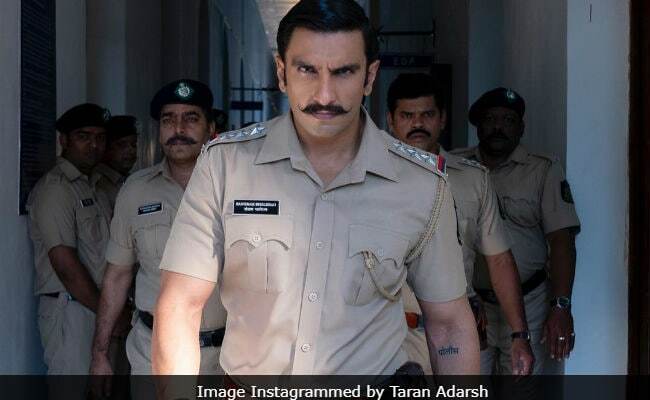 Seems like there is no stopping for Rohit Shetty's Simmba, starring Ranveer Singh and Sara Ali Khan as the film has managed to collect over Rs 159.83 crore within two weeks of its release, reports Bollywood trade analyst Taran Adarsh. That's not it! The film earned Rs 9.02 crore on Friday alone and it is expected to garner Rs 175 crore in the second weekend itself. In his tweet, Taran Adarsh also predicted that's the high-octane action film is likely to enter the Rs 200 crore club before the third week. "Simmba starts Week 2 with a bang... Will cross Rs 175 crore in weekend 2 itself... Will make an entry into Rs 200 crore club before week 2 concludes... (Week 2). Fri 9.02 cr. Total: Rs 159.83 cr. India biz." #Simmba starts Week 2 with a bang... Will cross 175 cr in Weekend 2 itself... Will make an entry into 200 cr Club before Week 2 concludes... [Week 2] Fri 9.02 cr. Total: 159.83 cr. India biz. In a separate tweet, Taran Adarsh revealed that Ranveer Singh's film is not only performing well at the Indian box office but also in the international arena. The film earned over Rs 58.62 crore within a week internationally. "Simmba is outstanding in international markets... Concludes Week 1 on a glorious note... Collects $ 8.408 million (Rs 58.62 crore)," tweeted Taran Adarsh. Simmba is Rohit Shetty's 8th consecutive film to cross Rs 100-crore mark, while Ranveer's fourth film to cross over the 100-crore hurdle after Ram-Leela, Bajirao Mastani and "Padmaavat" - all three directed by Sanjay Leela Bhansali.